-JdK- A photo found in an old copy of "Motor" and in my biased opinion one of the best looking Carroll-CS1s ever! Specs include a three-stay frame, heavy-duty TT Webbs, 8" Enfield hub rear, probably the 7" Horton hub at front, 20"/21" wheels rear/front, positive-stop Sturmey-Archer box without kickstart, Lucas KS1 magneto, straight-thru pipe. Carburetter probably an Amal and fitted horizontally in the conventional 1920s manner, not a flange fitting. The licence OF9502 was issued between May 1929 and April 1930 in Birmingham. All of which suggests a works special. Surprisingly, the OF9502 licence featured on these pages before but on a very different Norton (below)! The pic comes from an article in The MotorCycle and in the caption suggests it used to be Woods' bike and that it was crashed into a van. Looking at the differences (note the frame and downdraught cylinderhead), about the only thing these bikes seem to have in common is the numberplate... and the CS1 above seems to be the earlier one. -SG- Obviously Nortons, like plenty of other manufacturers, had no qualms about moving registration numbers around when it suited them. Wonder if they stamped up the two stay frame with the three stay frame number. 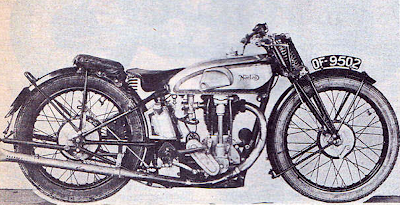 The three stay photo (top) has appeared in various places and seems to be a retouched publicity photo of - more or less - a 1930 TT Specifications bike although it is not wearing the small chain oiler tank on the front engine plates. I have seen it in John Griffith's book 'Famous Racing Motorcycles' and as he worked for Motor Cycling, he perhaps obtained it from their archives. As the Torrens road test reveals, in its two stay form the bike was Woods' Ulster winner and at that time the gear box was still three speed, not four. OF9502 was loaned to and ridden by J Sugg in the 1931 MGP. He then bought it and in due course passed it on to Joe Hoult who passed it on to Chris Harrison - see CEA/Norton Story. By the time Chris got it, it had Norton check spring forks and a four speed box.